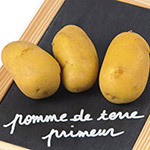 New potatoes from Brittany have thin, fine skins, easily scraped off. They are picked by hand and then gently washed. They owe their sweet flavour to the earliness of the harvest: the sugars have not yet converted into starch. Result : they melt in the mouth and everyone loves their sweet flavour. However, the season is short : they are only available in May, June and July. We supply these potatoes in wooden boxes. • firm-fleshed (varieties : Charlotte, Amandine… New varieties have also been selected : Celtiane, Léontine…). • deep pink flesh (varieties : Chérie, Roseval, Franceline…). • floury (varieties : Agata, Samba…). 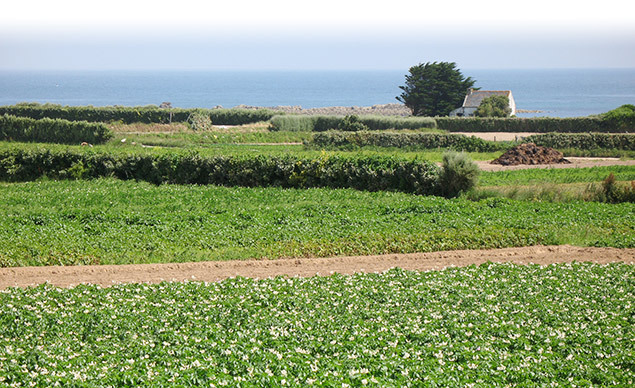 All these varieties are supplied in 12.5 kg boxes. 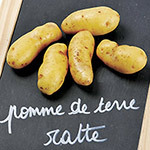 We also supply « grenaille » or baby potatoes (less than 28 mm, 30-35 mm or 35-38 mm) in 10 or 12.5 kg boxes. 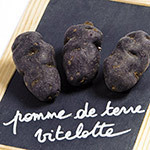 Vitelotte potatoes have dark violet-blue flesh and a deep purple skin. They are highly prized by leading chefs for their delicious nutty flavour.